To reduce the need of repairs on your dryer appliance, be sure to follow the following preventative measures. Proper care & maintenance is critical in keeping your dryer running efficiently. Not maintaining your dryer will cause your unit to overwork by using more electricity to dry the same load of clothes than if properly maintained. By following these tips, you can prolong the life of your dryer and improve its heating while avoiding a visit from us at Nashville Appliance Repair. Did you know that the U.S. Consumer Product Safety Commission (CPSC) estimates that 15,500 fires associated with clothes dryers occur every year! Vent your dryer to the outside, never vent it inside. Clean out the exhaust vent system at least once annually to remove clogs or other obstructions that could impede good air flow and ventilation. NEVER vent dryer into house, always vent outside. Never vent with plastic or vinyl. 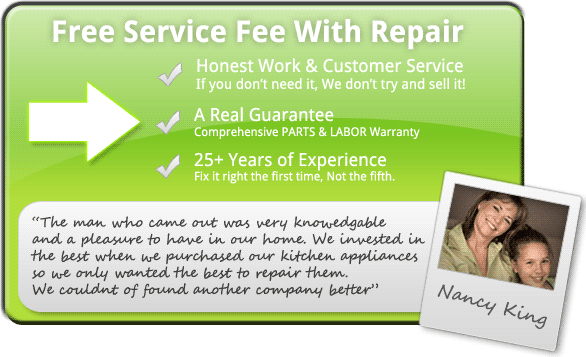 Many people hire Nashville Appliance Repair to do their venting and service their dryer yearly. Knowledgeable technicians can clean all interior and exterior ductwork to ensure a smooth running system and help prevent fires. Empty the lint filter after each and every use for the most efficient drying and fire prevention. Check for anything else that ccould impede good air flow. It's important to clean the back of the dryer where lint settles over time. Do not place foam backed rugs, rubber/plastic shoes or other heat sensitive articles in dryers. Also, to prevent fires, do not place any type of cloth that my have been soiled with flammable substances like gasoline and alcohol unless they are fully and completely cleaned. Check the pockets of clothes for wax crayons, soft plastics and other heat sensitive items that may ruin your load of laundry. Do not overload the dryer and make sure items are not water logged. This may burn out the motor. It might seem to be more efficient to wash large loads, when in fact, it will take longer to dry.